1.Prepare Ginger Scones: Preheat oven to 350°; line rimmed baking pan with parchment paper. In large bowl, whisk flour, ginger, sugar, baking powder, salt and lemon zest; with pastry blender or fingertips, cut in butter until mixture resembles pea-sized crumbs. Stir in 3/4 cup cream until mixture comes together. 2.On work surface dusted with flour, pat dough out to 1/2-inch-thick circle; cut into 12 wedges and place on prepared pan. Brush tops with remaining 1/4 cup cream; sprinkle with coarse sugar. Bake 30 minutes; cool and store in an airtight container at room temperature. 3.Prepare Grand Marnier Roasted Strawberries: In 13 x 9-inch baking dish, combine strawberries, sugar, juice, Grand Marnier and orange zest; cover with aluminum foil. Bake 1 hour, stirring every 20 minutes; cool, cover and refrigerate. 4.Prepare Whipped Mascarpone Cream: In large bowl, with mixer on medium speed, beat cream, mascarpone, sugar and vanilla extract 3 minutes or until soft peaks form. 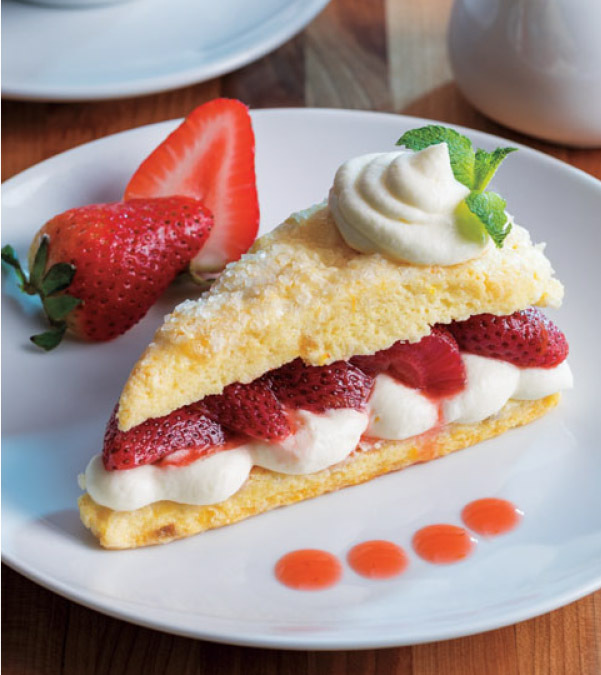 5.To serve, cut scones lengthwise in half; top bottom halves with whipped cream, strawberries and top halves of scones. > For a professional touch, transfer Whipped Mascarpone Cream to a pastry bag fitted with a round tip.